The tedious school routine has now begun and so has the pressure to look good at school gate mingling with other parents. It can get difficult at times managing family and social life whilst keeping a tab on your beauty regimen. 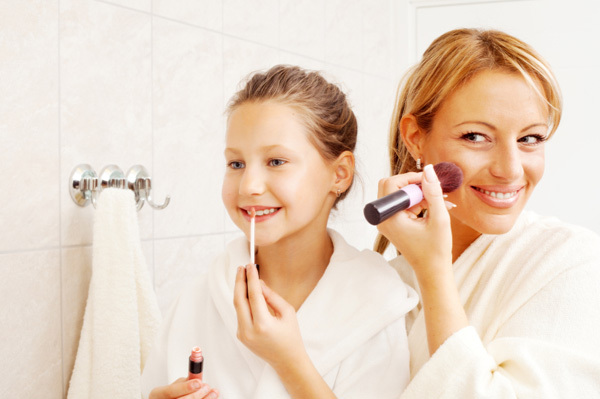 Hence we present to you our favourite back to school beauty services for moms on the go. These will ensure you look polished and put together in the least amount of time. We have ensured to handpick low-maintenance beauty treatments that will keep you looking fresh, energised and youthful no matter how little time you have on your hand to get ready. Threading/Waxing – If you have very little time to get ready on a daily basis, it is important to have a face that’s free of peach fuzz. Hairless, smooth and silky skin will automatically create a perfect canvas for skincare and make-up. Pores will have space to breath, will clog less and consequently leave you with clear skin. Perfect for days when you want to go bare faced! Threading your eye brows will instantly reshape your face, give it depth and definition and make you look put together in a matter of minutes. Eye Lashes & Eye Brows – Be it false lashes, individual long lasting lashes, semi permanent mascara or lash and brow tint you are interested in, any of these beauty treatments will enhance your natural looks, need low maintenance and ensure you wake up looking glamorous and youthful even after a few hours of sleep. A fuller set of wispy lashes and tinted textured brows will take away the need for mascara or eye brow pencils when you literally have 5 minutes to rush out of the door. If you have scanty lashes and sparse brows, this is a popular back to school beauty treatment amongst busy moms. Brazilian Blowdry – Particularly useful for moms with frizzy, thick, unruly hair that is difficult to manage. This keratin replenishing protein treatment that promises to last 3-6 months will tame hair and leave it looking sleek, glossy and luscious. Hair will feel softer and will look straighter and manageable than usual every morning! No more trying to squeeze in 5 minutes to straighten hair when trying to get the kids ready. After a Brazilian Blowdry, busy mums can leave hair worries aside and concentrate on other chores for the day. CACI – For mums in their 30’s and above, we suggest a treatment of CACI instead of your regular facial. CACI is an advanced electronic facial that aims to re-educate your facial muscles, give them a little workout and inject an intense dose of moisture. It’s termed as a face lift facial due to it’s amazing results and is a great alternative to cosmetic surgery, botox and laser peels. Perfect for moms with dehydration, wrinkles, fine lines, pigmentation, uneven skin tone and so on. This will make you look like you’ve just gotten back from a holiday in the sun and leave other moms jealous with envy! Dermal Filler – If you always look ill, tired and sleepy, it may be due to the dark circles underneath your eyes a majority of times. If expensive eye creams have left you in despair, Dermal Filler is a non-invasive, pain free yet guaranteed way to replenish the lost volume underneath your eyes. The skin there will be left plump, supple and fuller hence bouncing off light and ironing out any wrinkles. It’s a miraculous treatment for stressed mums tangled in a manic schedule. If you’re a mom worried about ageing, Dermal Fillers is something you have got to try to see the fantastic results for yourself.